Use this handy reference list in your classroom when students have questions about our state symbols. These icons and emblems represent Wisconsin's heritage. In the early 1800s Southwestern Wisconsin miners were too busy digging the "gray gold" to build houses. Like badgers, they moved into abandoned mine shafts for shelter. 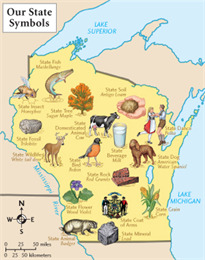 As a result, Wisconsin was nicknamed "The Badger State." It became a fitting description of the hardworking and energetic settlers of the Wisconsin Territory. Over the years the badger appeared officially in the coat of arms, the seal, the flag, the state song ("Grand old badger state! "), and as an architectural detail in the state capitol. "Bucky Badger" is also the long-standing mascot of the UW-Madison. The white-tailed deer, in all its grace and power, perked its ears as it was appointed the state wildlife animal in 1957. Reflecting the importance of the dairy industry in Wisconsin's economy and heritage, the docile dairy cow became the state domesticated animal of "America's Dairyland" in 1971. Reflecting Wisconsin's continuous drive to be a national leader, the state adopted "Forward" as the official state motto in 1851. The Wisconsin state flag was adopted in 1863, redesigned in 1913, and last altered in 1979. The flag is dark blue silk, with the coat of arms of the state. The edges are trimmed with a knotted fringe of yellow silk. The coat of arms contains symbols that represent the diversity, wealth and abundance of resources in Wisconsin. The rhythmic and rousing beats of "On Wisconsin," already a popular football song since 1909, began filling the air as the official state song in 1959. Chosen by school children in 1908, the wood violet was adopted as Wisconsin's official state flower on Arbor Day 1909. The violet's gentle green leaves and purple petals sway in the breeze reflecting Wisconsin's scenic beauty. A welcome sign of the coming spring, the red-breasted robin won the hearts of school children across the state, who voted to name it the state bird in the 1926-1927 school year. With its bright yellow fall colors, and its delectable spring harvest of sweet maple sugar, the sugar maple became the state's official tree in 1949. Source of many monster fish stories in the state's famed Northwoods, the "muskie" leapt into the state books as the official state fish in 1955. A combination of abundance, uniqueness, economic value, historical significance and native nature lead to the appointment of Galena as the state mineral in 1971. Chosen for its economic importance in the state in 1971, the speckled igneous rock is composed of quartz and feldspar. With a gentle "coo" and a graceful flap of its wings, the mourning dove flew over the state as the official symbol of peace in 1971. The state recognized the sweet contributions of the honeybee as it buzzed from blossom to blossom in 1977. Created during the last great glaciers, the level, silty soil was chosen to represent the more than 500 major soil types found in Wisconsin. Flourishing in the warm, shallow salt waters of prehistoric seas, the extinct marine arthropod crawled its way into the state record in 1985 as the state fossil. Full of life, and always ready to spring into action for the hunt, the American water spaniel won the hearts of the citizens of Wisconsin, who selected it as the state dog in 1985. The perfect compliment to cookies, "America's Dairyland" chose to make milk the official beverage of the state to echo its abundant dairy heritage in 1987. Used for everything from livestock feed, to ethanol fuel, to the cornerstone of a delectable summer barbecue, corn was made the official state grain in 1989 to bring attention to its many uses. Reflecting the rich German heritage found throughout the state, Polka was adopted as the official state dance in 1993. Between 1870 and 1900, dairying rose to a prominent place in Wisconsin agriculture. By World War I, Wisconsin ranked first in the nation in dairy production. In 1940, the Wisconsin Legislature promoted the "Dairy State" reputation by placing the slogan, "America's Dairyland," on automobile license plates. Today, Wisconsin produces 15 percent of the country's milk, 25 percent of its butter, and 30 percent of its cheese. The World Dairy Expo in Madison annually attracts over 70,000 visitors from around the world to learn the latest developments in the dairy industry. Fourth grade students from Mineral Point Elementary helped cheese become the State Dairy Product in 2017. The class came up with the idea on their own and then followed the appropriate legislative process to have cheese recognized for its important role in Wisconsin. Wisconsin has been a leader in cheese production for more than a century and regularly wins international cheese competitions.